AddFreeStats Analytics is a free tool that helps webmasters to measure and track website visitors. This service is well designed to work perfectly with Homestead sites and is one of the most accurate tools that offer real time traffic analysis. AddFreeStats also keeps good record of every traffic activity and keeps historical data. AddFreeStats offers advanced website statistics reports and helps the webmaster to improve the performance and the quality of their website by focusing on some areas and issues addressed. AddFreeStats tracking code is developed with the latest available technology and speed up your website load time. Here is a quick installation guide on how to integrate the Addfreestats to your Homestead site. 1)	First of all you will need to create a free account with Addfreestats.com so that you can get access to different features and options. You will also get a unique tracking code for your website. 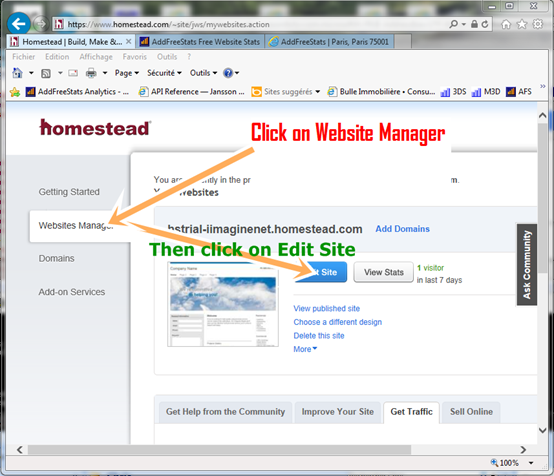 3)	Log in to your Homestead account and then click on ‘Websites Manager’. Next, head over and click on ‘Edit Site’ blue button. 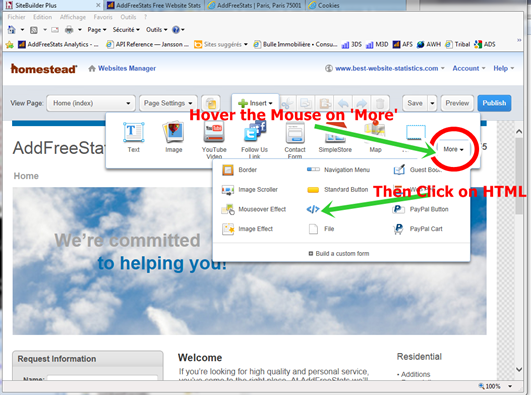 4)	Click on ‘Insert’ on the top navigation menu. 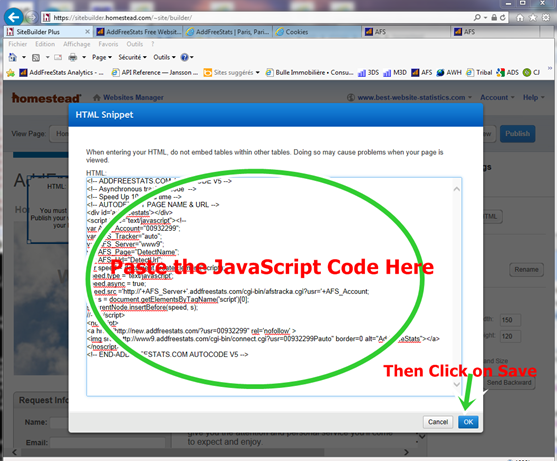 5)	Next, hover the cursor over the ‘More’ link on the right side and then select ‘HTML’. 7)	Place the box anywhere you wish to display the Addfreestats button and then click on "publish and this page" for the changes to take effect. Repeat the same for all your Homestead website pages. Now AddFreeStats tracking code has been successfully installed in your Homestead site and should start working immediately. 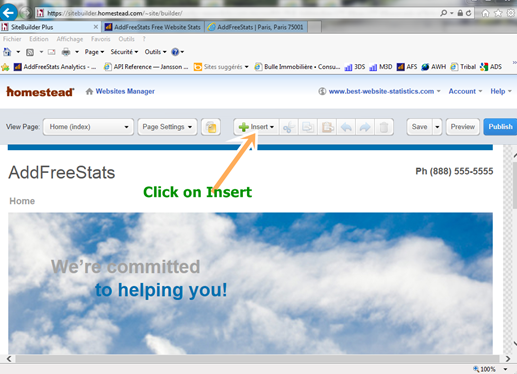 To get access to statistics reports of your Homestead website, you can click on the Addfreestats button link on the footer of your site. You can also get detailed traffic analysis by logging into your Addfreestats account. In the account you can also customize and get traffic details that can help improve site performance through the historical data.